Positive reviews pour in for Tampa International Airport, ranking it a 4.5 out of 5 star on the Yelp user-generated review site. It’s a nice compliment to their No. 2 ranking by travelers for having the best customer service and No. 5 in the world. TIA has more than 900 online comments posted about TIA from local, national and international travelers. 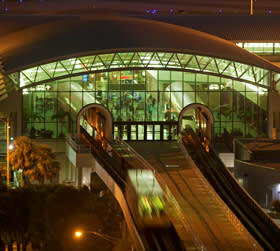 Many reviewers post photos along with their comments, sharing why they love Tampa’s airport so much. Free Wi-Fi, private workstations, crowd-pleasing shops, restaurant and bars just to name a few. Many of those reviews praise the easy accessibility and convenient accommodations. And speaking of accommodations, “The Guide to Sleeping at Airports” deemed TIA to also be one of the best airports to hunker down for the night. With comfortable temperatures for sleeping and a hotel connected directly to the airport. But above all, reviewers are impressed with the ease of getting through security quickly and efficiently. Even though the Airport is undergoing a $1 billion expansion project, TIA continues to give TPA high marks on the review site.